The New York Times and its International Herald Tribune analyzed King Juan Carlos’ place in modern Spain and recent controversies relating to the Monarchy. The feature contrasted pro-republican feelings, discomfort about the Royal Family’s unknown wealth, the controversial hunting trip to Botswana and the country’s economic troubles with the King’s role as Spain’s top booster. The Monarch, for example, helped secure a multi-billion dollar high speed rail contract in Saudi Arabia. The king is widely valued in business circles for acting as a sometime deal maker and economic ambassador for his nation, but how he has amassed his substantial personal wealth remains secret. The Spanish royal family’s wealth has been estimated at up to $2.3 billion, a sum that supporters contend was inflated by the inclusion of government properties. 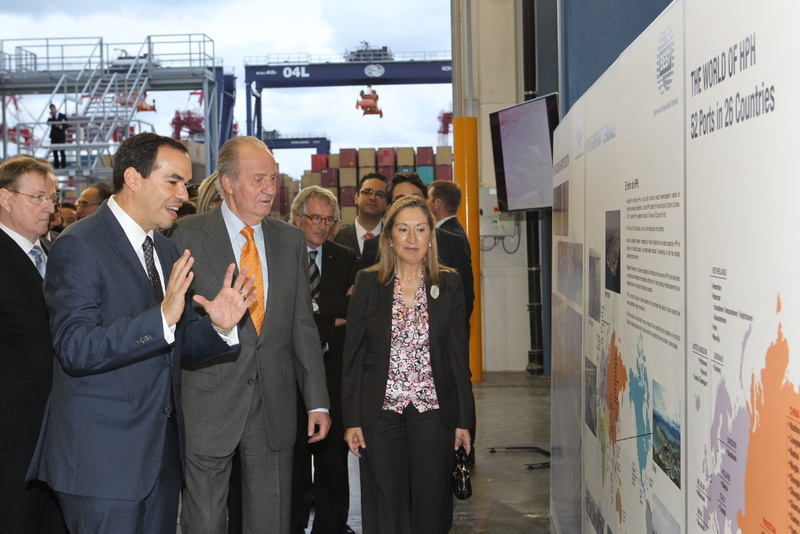 King Juan Carlos inaugurating new port terminal in Barcelona. It was another chance to meet with Catalonian President Artur Mas. The King, who was recently in New York, stressed the need to promote Spanish trade as a means to improve the Spanish economy. He also spoke about his own role in the country’s future. “The monarchy will continue as long as the people want a monarchy,” the king said on a swing through New York last week, part of a palace strategy to meet with top opinion makers to help promote confidence in Spain. Prince Felipe and Princess Letizia in the Canary Islands. But while the newspaper described the King as a non-ruling Monarch, it’s important to remember his role in public life, which in many ways goes beyond that of other European royals. 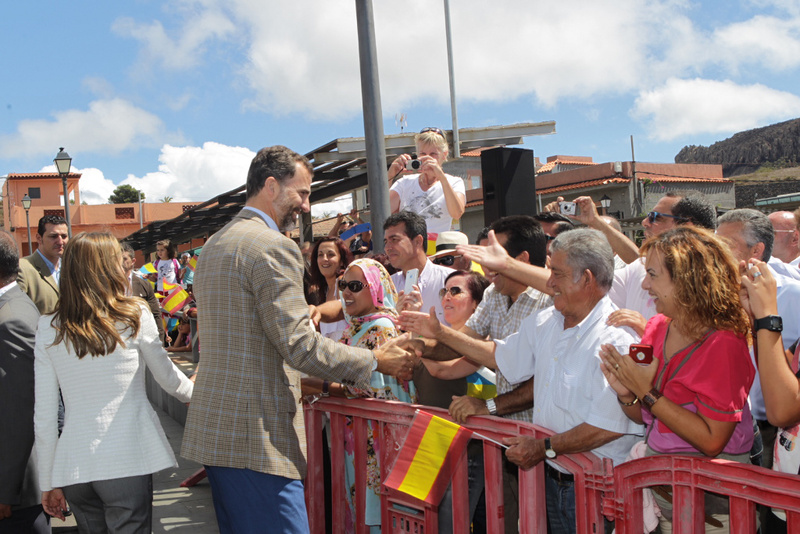 If they’re paying for a Monarchy, people in Spain want its members to do something other than ribbon cutting at events. While Queen Elizabeth refrains from expressing an opinion about anything, King Juan Carlos, for example, penned a public letter recently expressing his views, albeit indirectly, about Catalonian calls for independence. The Royal Palace has said such communications will become increasingly common. Queen Sofia at the Royal Theater. Click here to read the NYT story. King Juan Carlos met with Catalonian President Artur Mas during the Monarch’s trip to Barcelona today. It was a much anticipated — and in some quarters dreaded — meeting between both men. It comes amid Mas calling for early elections in the Autonomous Community of Catalonia and fanning pro-independence flames. 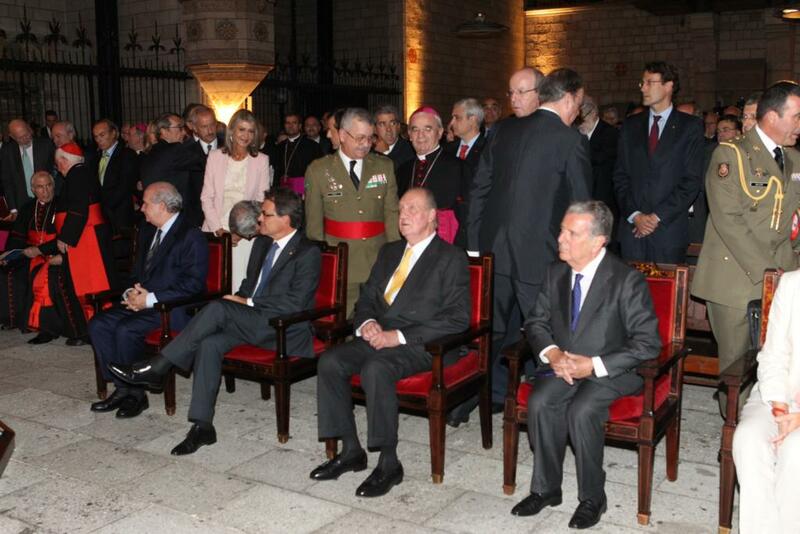 King Juan Carlos with Mas sitting to his right. The King traveled to the Catalonian capital to hand out the Count of Barcelona award to Cardinal Tarcisio Bertone. Count of Barcelona is one of King Juan Carlos’ titles. His Majesty, who had already released an open letter calling for unity among all Spaniards, expressed optimism about the country’s economic future. He called the economic and political situation “grave” but said Catalonians and all Spaniards “are capable of overcoming these circumstances.” He also spoke in catalán for good measure. Earlier this week the King was in New York attending the annual meeting of former U.S. President Bill Clinton’s Global Initiative, where he met with other heads of state and world leaders. 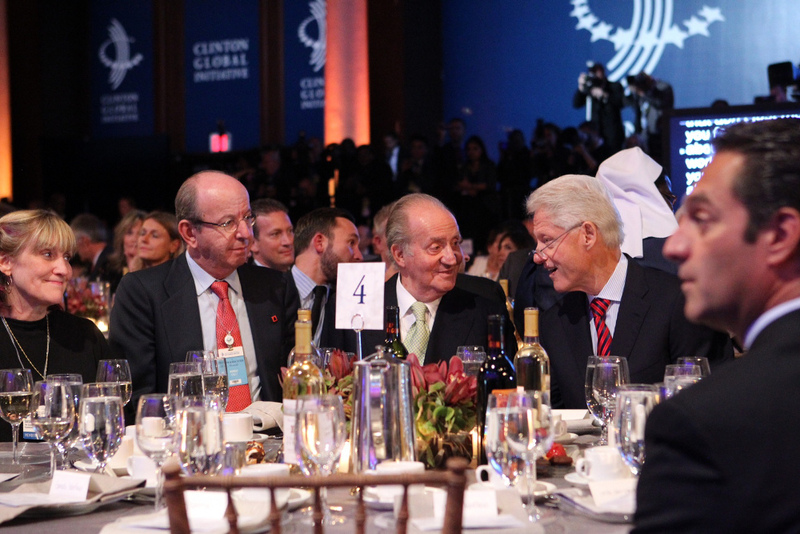 King Juan Carlos speaks with former President Bill Clinton. Meanwhile, members of the Royal Family have resumed a busy agenda. 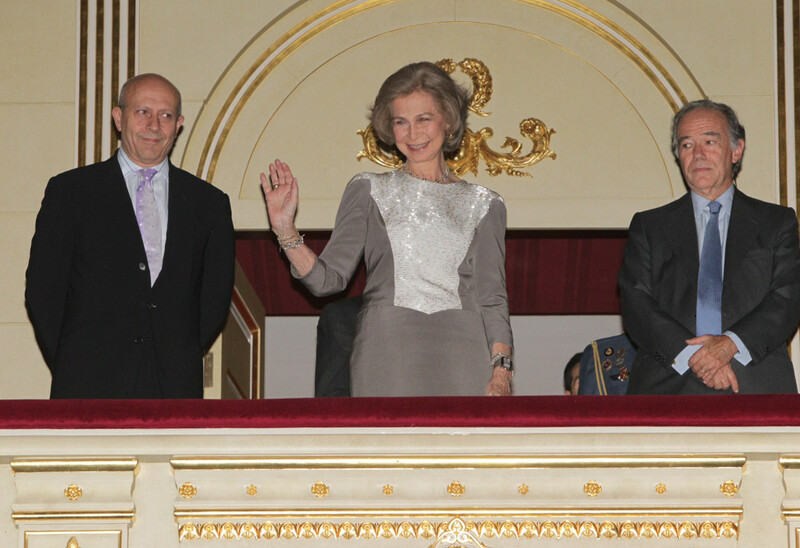 Today, for example, Queen Sofia attended a gathering of backers of the Reina Sofia Museum in Madrid. Queen Sofia at the museum. King Juan Carlos issued a short but stern call for unity today amid pro-independence suggestions by the leadership of the autonomous community of Catalonia. The King recognized the tough economic and political conditions but said all Spaniards had to work together to secure the country’s social and democratic goals. 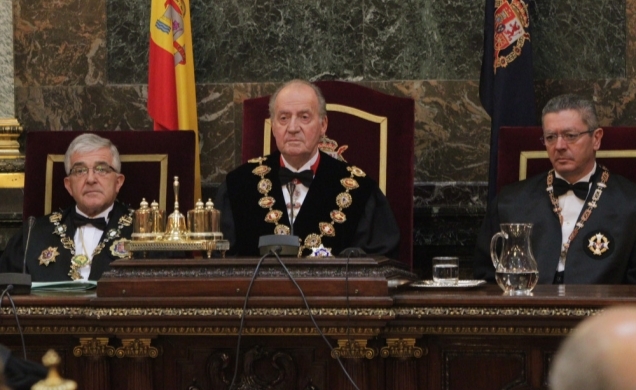 King Juan Carlos at the Palace of Justice, opening the judicial year. “In these circumstances, the worse thing we can do is divide forces, promote divisions, follow illusions and deepen wounds,” His Majesty wrote in an open letter. As expected, minority parties and the Catalonian leadership did not exactly welcome the letter. They stressed the importance of self determination and the search for new solutions to the country’s problems. 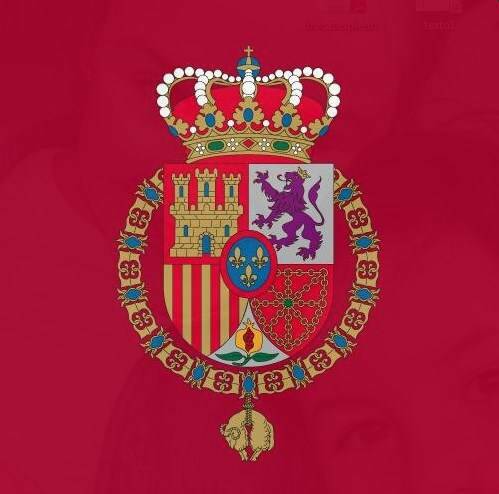 The Spanish Royal Household has overhauled its website, getting rid of an outdated series of pages for a more sleek and modern look. The new website is not only an effort to update the Royal Palace’s internet presence, but also reach out to many Spaniards who have expressed skepticism about the Monarchy, especially young people who may not be as aware of King Juan Carlos’ role in the transition to democracy. The new site includes new pictures of the Royal Family, information about the Crown’s role in Spanish government and society, and videos of pivotal moments in history. 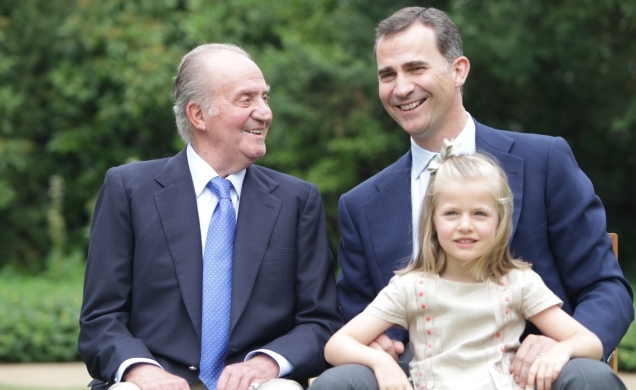 King Juan Carlos, Prince Felipe and Infanta Leonor, who could someday become Queen. Prominent are pictures and videos of the King and Prince Felipe swearing allegiance to the Spanish Constitution. The King’s 1981 message to the country amid a coup attempt is also included. Prince Felipe and Princess Letizia, and daughters in their home near Zarzuela Palace. Charismatic and tender Queen Sofia has often been a powerful weapon for the Monarchy. Now they’re also deploying Princess Letizia. The website includes a photo spread focusing on the Princess by award-winning photographer Cristina García Rodero.